Are you a lime lover? If so, look no further because this is one amazing cookie. It’s sweet, soft, chewy, limey and amazing. Lime flavored treats are a summer staple in my house, I love the fresh, crisp flavor it imparts to both desserts and savory dishes. 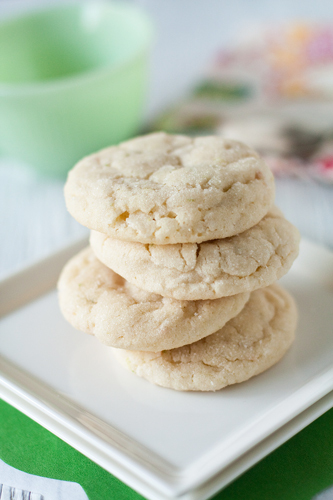 When I had my Hip Hostess giveaway last month, a reader left me a link to these cookies. Out of over 500 comments, this recipe stood out in my mind, so I immediately bookmarked it! Well, I am glad I did, because they are simple and brilliant! I actually followed this recipe exactly as written which is rare for me, but it honestly looked perfect. The coconut adds a slight textural element and it marries perfectly with the tartness of the lime and the sweetness of the sugar. This recipe compelled my friend, Jo to leave me a love note on my desk after I brought one to work for her. I am definitely going to play around with this recipe using other citrus fruits…think oranges, lemons and grapefruit! Now wipe the drool from your mouth and make them, eat them, and love them! Have a great weekend and thanks so much for checking out this fabulous recipe! Preheat oven to 350 degrees. Line cookie sheets with parchment paper. In a small bowl, stir together flour, baking soda, baking powder and salt. Set aside. Using a mixer, beat together the butter and sugar until smooth and very fluffy. Beat in egg, vanilla extract, lime juice and lime zest. Gradually blend in the dry ingredients and toasted coconut. Roll rounded teaspoonfuls of dough into balls, and roll in sugar. Place on lined cookie sheets about 1 1/2 inches apart. Bake 8 to 10 minutes in the preheated oven, or until lightly browned. Let stand on cookie sheet two minutes before removing to cool on wire racks. This is a great-tasting recipe. Thanks for sharing it. It’s a keeper. I used lemon instead of lime and chilled the dough overnight. My cookies didn’t spread out as much as yours and were pretty puffy. I also used just 1/3 c. sugar in the dough and they were plenty sweet. I got 40 cookies using a 1 1/2″ diameter (#50) cookie scoop. I’m so happy that you enjoyed the recipe. Thank you so much for stopping in and sharing your experience with making the cookies. The substitutions that you made sound great! Happy holidays and thank you for following MBA! Sorry, in my previous comment I meant to say I made just half the recipe (it made 20) and used just 1/3 c. sugar. You can use either for this recipe. Your choice. I have made this and the lemon version dozens of times at work. I work at a retirement community and they recieve cookies every night, normally with fruit as dessert. Since I only do it every other weekend, I use both recipes for my cookies. The residents absolutely LOVE them!!! It’s different from the normal chocolate, peanut butter, or raisin cookie. Especially with the rough weather here in PA had. These are nice and refreshing. I had a request to make these with oranges. Do you think it will taste alright? I think the cookies would be great substituted with orange! Please stop back and let us know your experience in making them (and if they go over as well as the lime), and have a wonderful day! Made these today and they were fantastic although I found the lime and coconut flavors very subtle, but everyone in my family loved them. As a note, I made these at high altitude and found they still baked up well. Thanks so much for the feedback! I’m glad to hear your family enjoyed them! These are amazing!!! I added a little orange juice to my batter and lime and orange zest into my rolling sugar, fantastic & so pretty! Whenever I take the time to make these awesome cookies I usually make about a dozen batches. Friends and family can’t get enough of these. I make some with lime, some with lemon, some with orange, and once with blood orange. I add a little food coloring to each batch so people can grab their favorite. (Lime=Green, Lemon=Yellow, Orange=Orange) I’ve never had a complaint with these cookies. They are often my go to cookies for charity bake sales. I make these regularly for events. I was pointed to this recipe years ago by a friend and return to it often. I took a tip from her and typically separate this into two batches – one for everyone, including the kiddos, recipe as-is (perfect! ), and to the other batch I add red pepper flakes for a surprise kick. Oh how people rave!! The chili-lime-coconut combo is magical. You can also chop red chilies finely, or use another dried pepper spice, but so far the red pepper flakes have been the most versatile and tasty, and you can adjust your heat level easily depending on the crowd. I love that idea, Trish! I’m definitely going to try it! These were great! My only comment is that I think a “teaspoonful” seemed very small to me (unless it’s wrong to use an actual teaspoon for measures.) The cookies were tiny. So I did about a tablespoon on the second batch and they were the perfect size. However, a few people in my office loved the small version since they are trying to be mindful of sugar intake! What a great recipe! I use it for making medical cannabis edibles. I use coconut infused Cannabis oil instead of butter. The Citrus is perfect with the mixture of notes & flavors. What a great recipe, thanks so much for sharing. I made these when company was over, and we ate the whole batch while they just out of the oven. I’m tempted to add rum extract in a future batch, or would that be overkill? Also wondering if pineapple swapped for the lime would work just as well. So glad to hear you enjoyed the recipe, Lydia. I have’t tried them with the mentioned extracts, but I think they could be really delicious. Thanks so much for your feedback! Delicious! Substituted part of the butter with coconut butter. Makes the cookie a little chewier. Thanks for a great recipe! So glad to hear you enjoyed the recipe! Thanks so much for stopping by and leaving your feedback! One of the best cookie recipes I have ever tried! They turned out so well and it’s crunch outside and chewy inside! I tried regular white sugar, powdered sugar and non sugar for rolling the doughs and I liked the powdered sugar the most. Powdered sugar ones got really nice yummy looking cracks on the surfaces of the cookies. And they have little more crunch feeling outside. Non sugar ones had more lime flavor and nice hint of salt in the end when I tried it. Oh! And Indid not have toasted coconuts at home so I baked them without them. I want to try with lemon and orange too! So happy to hear you enjoyed the cookies, Sophie! Thanks so much for stopping by and leaving your feedback! 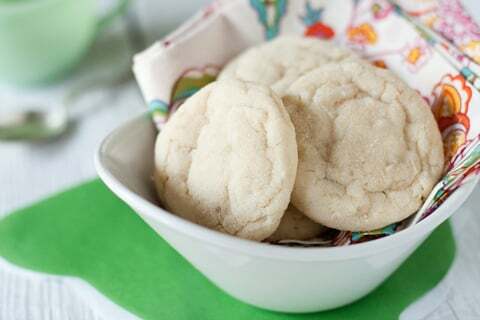 This is one of my favorite cookie recipes! It’s requested by family all the time. I’ve made it dozens of times now. Thanks!! So happy to hear you enjoyed the cookies, Kealani! Thanks so much for stopping by and leaving your feedback! The last time I made these cookies, I rolled some in sea salt in lieu of sugar, which gave it a neat flavor/texture. Thanks so much for stopping by, Lydia! I appreciate you taking the time to comment. Happy Baking! Love these cookies! I have a bake sale coming up and wanted something quick, delicious and easy and this recipe checked all! I made Lime with coconut, Lemon with coconut, and Orange with finely chopped walnuts. Thanks! So happy to hear you enjoyed the cookies, Sandy! Thanks so much for stopping by and leaving your feedback!